When spouses agree to utilize the collaborative process to dissolve their marriage, the parties and their attorneys will sign a Participation Agreement. The Participation Agreement is a contract that sets forth the terms and expectations of the parties throughout the collaborative divorce process. By signing the Participation Agreement, the parties are committed to the collaborative divorce process. This ensures that the spouses and their attorneys are devoted to a negotiated settlement. While the specific language of a Participation Agreement may vary, there are essential components that you can expect to be included the document. The Participation Agreement sets forth that the parties and attorneys agree that they will resolve all matters in dispute by settlement agreement only. Neither party nor counsel will seek Court intervention to resolve disputed matters. The Participation Agreement will clarify that the scope of the attorneys’ representation is to participate in the collaborative process. If at any point either spouse seeks Court intervention to resolve a disputed matter, both attorneys will withdraw from the case. At that point, the parties would need to seek new legal counsel. This requirement ensures that not only are both parties committed to the process, both attorneys are as well. As part of the collaborative divorce process, the parties agree to release relevant and necessary information to all parties, including the lawyers and other team members, if appropriate. This is an important provision in the Participation Agreement because it allows for open, frank, and direct communication to resolves all issues from a solutions-based approach. Due to the collaborative nature of the process, the attorneys may learn of information that they might not have otherwise if the parties were engaged in traditional litigation. Parties participating in the collaborative process agree to open, honest, and transparent communication regarding all relevant issues. As such, the Participation Agreement will require the complete and full disclosure of any necessary information or documents. Parties to the collaborative divorce process commit themselves to resolving all matters without litigation. For the process to be effective, the Participation Agreement requires that the parties commit themselves to being open, honest, professional, and transparent in the process. 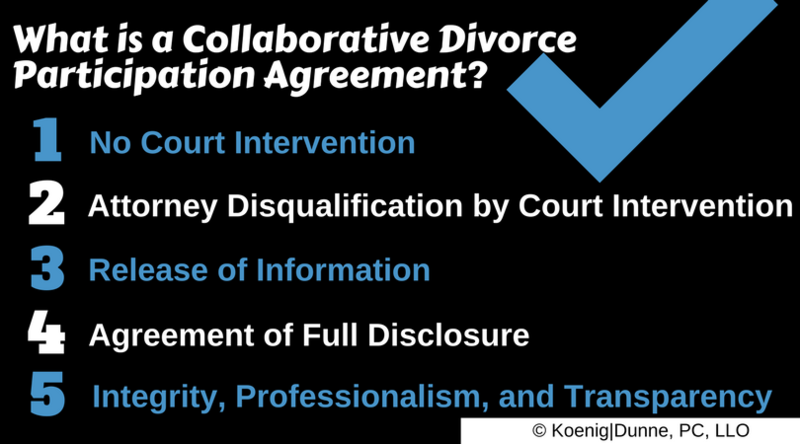 The Participation Agreement provides an important foundation for the success of the collaborative divorce process. If you’re interested in collaborative divorce, make sure you discuss with your lawyer the details of the Participation Agreement to make sure you fully understand the what is expected of each party and how the process will unfold. By: Angela Lennon, collaborative attorney at Koenig│Dunne, PC, LLO. Contact Angela at www.koenigdunne.com or (402) 346-1132.